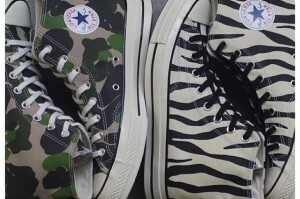 The Chuck Taylor 1970s Duck Camo and Glow-In-The-Dark Zebra are available for preorder from END. These are the first to prints ever to grace the infamous All-Star Chucks. An almost exact retro of the 1972 classic, but with a smaller toe box, reinforced heel strips, branded bumper, nickel eyelets and a cushioned sock-liner. Most sizes are still available, but these went quick when they hit offspring and we don’t expect them to sit.